Ever since I hit middle age, it seems like 3:00 a.m. calls my name, whether I want to hear it or not. Many nights, I’m wide awake with no reason. I’m not anxious, sick or troubled. I’m simply awake and unable to get right back to sleep. This insomnia used to annoy me, until I realized it held opportunity to draw me closer to God. 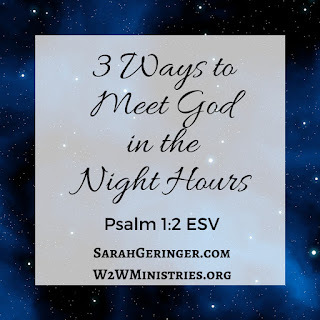 Here are three ways you can meet with God in the night hours and enrich your relationship with him. 1. Ask God to speak. When Samuel was a boy, God called out to him in the night. He thought Eli the priest was calling for him, but Eli told him to say, “Speak, for your servant hears.” (1 Samuel 3:10 ESV). Then Samuel recognized and heard the Lord’s message to him in the middle of the night. You can also ask God to speak to you in the night hours. He may use those quiet, distraction-free times to speak unique messages to you and bring you special comfort. As the psalm for today states, we can meditate on God’s Word at all times of the day or night. I suggest that you keep a card by your bed with your weekly meditation verse. If you wake up, turn on the light for a few minutes so you don’t get too alert. Read the verse, turn off the light, and then repeat it in your mind, savoring each word. This meditation will bring you peace and help you fall back to sleep. Most of us want to pray more often but don’t know when to do it. The night hours are an ideal time for prayer. Pour your heart out to God when you can’t sleep. He is waiting for you in the darkness. It’s a safe place to unburden your heart to him. If you really can’t get back to sleep, turn on the light and pray God’s Word back to him. This morning I whispered all of Psalm 18 back to God in the form of a prayer. God takes delight in hearing our voices repeat his words back to him. Pick a psalm to pray back to God the next time you struggle with insomnia. 1. Which tip will help you most the next time you have insomnia? 2. What psalm will you use to pray back to God? Ha. I actually woke up at 3:15am this morning! :) And didn't get back to sleep until around 5:30. I often recite memory verses in my head when I'm awake. And pray. And listen to podcasts. And occasionally read. That's a lot of time to take advantage of. :) Thanks for these encouraging tips, Sarah. Such wonderful tips. I do actually either wake up often or am not tired and up half the night. As I've aged and with retirement, I sometimes don't have as good a sleep schedule as I should. I like your ideas; especially the one about reciting scripture as I try to fall back to sleep.